New arrivals 🕊 Sun-Worshipper Necklace with Tiger's eye and Golden Hematite Beads. This powerful piece promotes the strength and courage, will and personal power. It helps to release the fears and anxieties. The highest goal of spirituality is to know God. This is achieved through the activation of the spiritual Sun, located in our heart as a reflection of the visible Sun. Meditating on the Sun daily allows us to rise above ourselves and make our hearts pure. Wear this necklace as a reminder of your true nature. You can choose the pendant in two shapes: disc and drop shape. 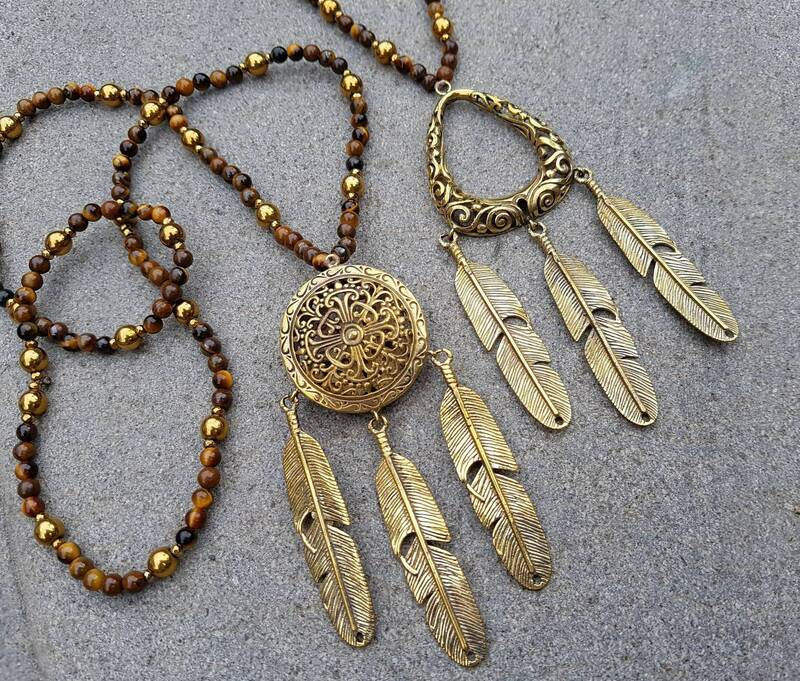 The necklace with the drop shaped pendant is 16.53 inches (42 cms) long from the top to the tip of the feather, the one with the disc shaped pendant is 15,74 inches (40 cms) long. The disc shaped pendant itself is 3.5 inches (9 cms) long from the top of the disc to the bottom of the middle feather and about 1.57 inches (4 cms) in its widest part. The drop shaped pendant is 3,93 inches (10cms) long from the top of the drop to the bottom of the middle feather and about 1,69 inches (4,3 cms) in its widest part. Tiger's eye and Golden Hematite Beads. The design of this pendant is originally hand carved and then has been cast in golden brass.